Every woman has the right to be beautiful and gorgeous. Some women find that confidence in makeup. Korean makeup brands are not as famous as European or American companies, but many South Korean beauty products are cheaper and higher quality. South Korean makeup brands specialize in making products for all races, so anyone can easily wear their makeup. Here are the five best Korean makeup products, all of which can be found on Amazon. Etude House is a popular South Korean makeup brand known for their eye shadows and colorful names. PHOTO VIA FLICKR USER SODANIE CHEA. The Face Shop Rice Water Bright Cleansing Foam is literally made with rice water. When we wash our face, sometimes we feel dry. However, this product makes your face more moisturized and overall brighter. Also, even if you’re wearing heavy makeup, it cleans your face powerfully. Innisfree is famous for its Cushion line and natural ingredients. Their Cushion products are divided into three types: Ampoule Intense, Long Wear and Water Glow. My skin type is complex, so I use Water Glow. I recommend using Ampoule Intense in the winter, because many people suffer from dry skin during that time. The Ampoule Intense has a lots of ampoule in the cushion, so if you use this product, your skin will be smooth and tight. Also, it makes your skin brighter. 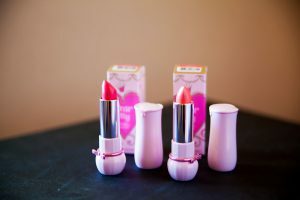 TonyMoly Lip Tone Get It Tint ran out of stock three times in South Korea. The product has so much color power that its lasts a really long time. Even while eating a meal, its color is supposed to remain on your lips. It’s also a liquid product, so anyone can apply this tint easily. Moreover, its size is so compact that anyone can have the tint on hand. This line of products is also divided into three types. The Cover Perfection Concealer hides the spots you want to conceal. Even if you have a spot that is really red or big, this will conceal it perfectly. This product comes in handy during finals or when your face is not doing so good.